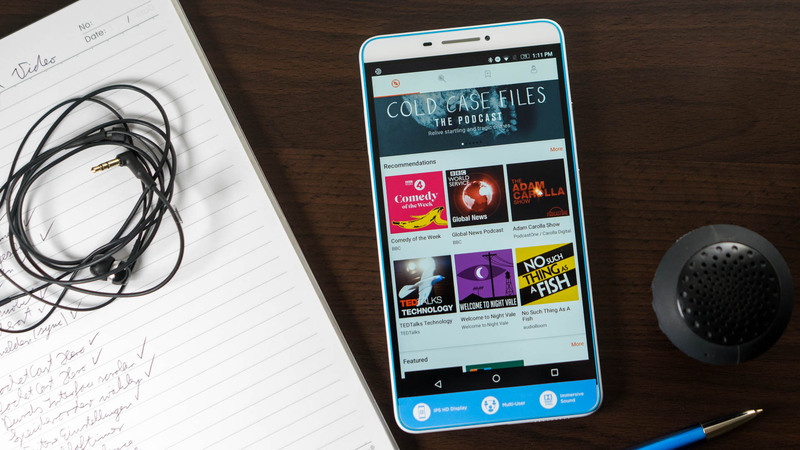 What are the best podcast apps for Android tablets? I love to listen to podcasts before going to bed, on a train ride or during a long flight. There are tons of podcast apps on offer inside the Google Play Store, a lot of them are free and for some you have to pay. Some are very good, others come with integrated and sometimes annoying ads or are to complicated to use. After trying a lot of different options I found the best podcast app for Android tablets and smartphones. And my choice is actually completely free. In my opinion CastBox is the best podcast app for android in the PlayStore. It is completely free, has no ads and runs very nicely. You don’t have to make any compromises with the design, with the user interface and are still getting pretty much all features you want from a podcast app. For most podcast fans it is the best option. CastBox offers all features I need from a podcast app. You can search for new ones very easily and even get recommendations based on your taste. You can download single episodes, stream them or sort them in a playlist. While listening to the podcast you get a lot of nice features that are quite important. For example there’s a sleep timer where you can set when the podcast should stop playing. If you can listen very fast you can also adjust the speed and can easily jump 15 seconds back and forth. Inside the settings you can set from which country you want to get recommendations. You can also specify if you want to download or stream new episodes using WiFi only or using your mobile internet plan. If you want you can choose to save new episodes on a microSD card as well and decide whether they should be downloaded automatically or manually. Once you register with CastBox using your e-mail, Google or Facebook you can also synchronize your podcast subscriptions with other devices. CastBox is a pretty nice podcast app with all the features I need. And it is free and has no ads. Let’s hope it’ll stay this way. If you search the web for the best podcast app for Android a lot of websites are recommending PocketCast. It is indeed a very nice app but it is not free. You have to pay 3.99 US dollars or roughly the equivalent in your currency. But is it worth it to spend 4 dollars on a podcast app? Well, it depends – for some maybe yes, for others probably not. PocketCast does look very nice and offers pretty much all features CastBox offers and even some extra ones. If you need or want those features, then yes it’s worth it to spend a bit of money. One of those extra features is that you not only have the choice to choose if you want to save podcasts on your local storage or an SD card, you can even specify the exact folder. There are a couple of other settings you can specify as well but I don’t think they’re really important. What is quite interesting though is the so called trim silence feature. Once you active it the app skips silent parts inside a podcast automatically – for example if the host pausing or taking a breath. That way you can save a bit of time. Other features like a sleeping timer are included as well. There are a lot of other podcast apps for Android tablets out there. Some of them are Podcast Go, Podcast Republic, Podcasty, Podcast Addict and Podcast. They sometimes offer similar features but I didn’t like them too much. Mostly because of intrusive ads or an old or complicated design. Which podcast apps do you prefer and why?